An investigation into such allegations would be extremely difficult in the remote area in which the abuses reportedly took place. So, how did investigators gain sufficient information? Full transparency around this crucial probe would certainly serve the public interest. More to the point, the key criterion in assessing the likelihood of misuse of military exports is “reasonable risk,” not “conclusive evidence.” The government’s insistence on using conclusive evidence of misuse as the key benchmark is a perversion of both domestic and international arms control standards. The word “evidence” does not appear in either the international Arms Trade Treaty that Canada will soon join or in Canada’s annual report on exports of military goods. Reasonable risk of misuse alone should inform a credible assessment of the likelihood that Canadian arms exports might be involved in human rights violations—and this risk has long been displayed. Yet the Canadian government remains determined to provide Saudi Arabia with the Canadian-made armoured vehicles at the centre of a $15-billion arms deal. When damning videos from 2016 first showed armoured vehicles being used against Saudi civilians, officials at Global Affairs Canada merely raised doubts that those vehicles were Canadian. But videos made in 2016 and 2017 unequivocally establish reasonable risk of misuse. 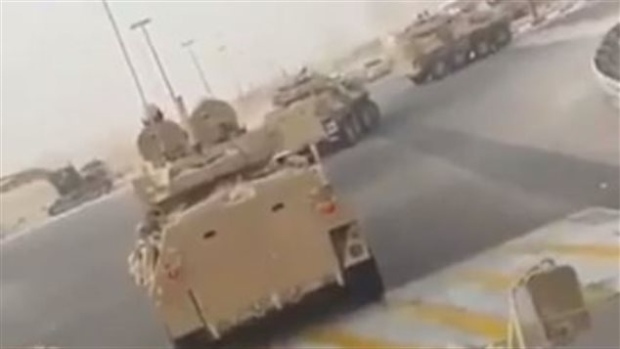 They document the proclivity of the Saudi regime to use force—specifically, armoured vehicles—against civilians. And there is no question that the vehicles in the most recent video were Canadian-made. In the seven months between the launch of the investigation and the announcement, the number of cholera cases in Yemen quadrupled to more than one million. Malnutrition, failing sanitation systems, and the collapse of critical infrastructure—all related to the Saudi-led military intervention in Yemen—have exacerbated the health crisis. As recently as this past January, there were reports of multiple Light Armoured Vehicles “shot up pretty badly” on the Saudi-Yemen border. Evidently, LAVs have been deployed and are involved in combat operations. A UN panel has also denounced the “widespread and systematic targeting of civilian targets” in Yemen by the Saudi-led coalition. And there is a term for this: war crimes. Yet Ottawa still refuses to acknowledge the reasonable risk of misuse of Canadian military exports. On the contrary, it takes every opportunity to reiterate its intention to proceed with the controversial arms contract, including Minister Freeland’s recent appearance before the House Foreign Affairs Committee. What kind of message is Canada sending to Saudi Arabia with its repeated emphasis on honouring existing contracts? That the deal will remain in force, “no matter what”? In fact, under international law, the fulfilment of arms contracts cannot be guaranteed, as they are contingent upon changing circumstances, including risk levels and the actual end use of the exports. Article 7 of the Arms Trade Treaty calls on states parties to reassess existing export permit authorizations in light of new, relevant information. This is especially pertinent with contracts that are executed over a number of years, as is the case with the Saudi arms deal. Given the Saudi regime’s consistent disregard for human rights, reports relevant to this particular arms deal can be expected to emerge with troubling regularity. The Canadian government is fully aware of the abysmal Saudi human rights record. Global Affairs Canada’s most recent human rights review of Saudi Arabia points to “a significant increase in the number of executions, restrictions on universal rights, such as freedom of expression, association and belief, lack of due process and fair trial rights.” Despite this awareness and despite legal challenges, civil society opposition, and repeated polls in which Canadians favour the protection of human rights over job creation, Ottawa remains undeterred in preserving the arms deal with Saudi Arabia. Canada promotes a feminist international assistance policy and claims to support a rules-based multilateral order. At the same time, it is arming one of the world’s worst oppressors of women and blatantly contravening the norms set out in the international Arms Trade Treaty. How can a state promote and protect human rights while providing arms to one of the most repressive regimes on Earth? As Canada prepares to join the Arms Trade Treaty, it appears that the government’s commitment to more stringent, transparent military export controls is not applicable to the Saudi deal. Will rigour inform subsequent contracts? The record is certainly not promising.